One of the more common fastening tasks for OEMs is attaching cover panels to a fabricated frame. In some cases these panels are designed to be removable, but in most cases they are permanently joined or are fastened by not intended to be removed in normal use. In a cost-reduction study we conducted not long ago, we compared the cost of securing sheet metal panels to a welded tubular frame by various methods. We wanted to expand and generalize that study to make it applicable to a wide range of American Fastener Journal readers. 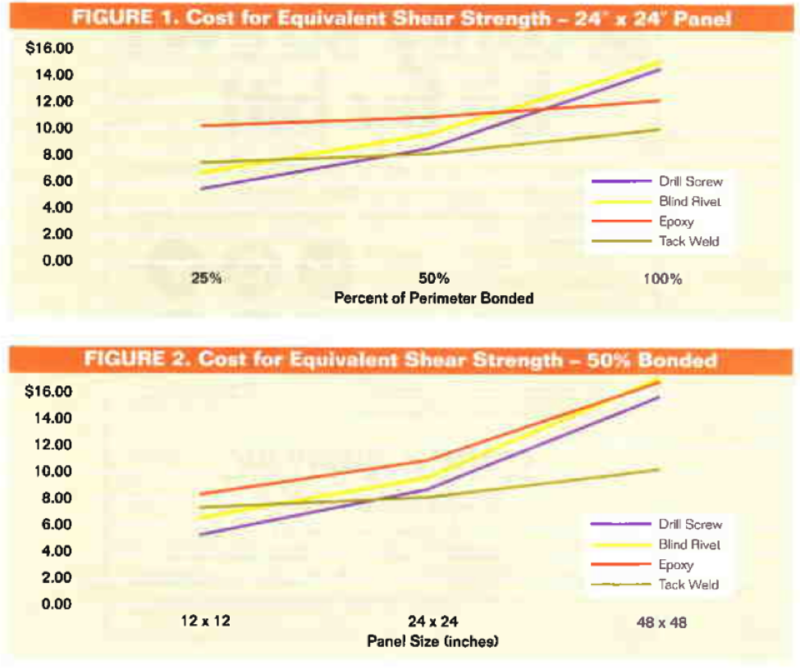 In this article, we compare the cost of fastening or joining a plain sheet panel using the methods listed in Table 1. These methods are not all-inclusive and were selected because they do not require high levels of capital investment in process or material handling equipment. In these cases, comparative costing tends to be function of calculating return on capital investment on equipment whose implementation is too specialized to be considered in an article on costing guidelines. As a practical necessity, we will need to make several assumptions regarding the component configuration and assembly conditions on which the estimates are based. Because these assumptions will have a significant impact on the cost estimates generated, the results of this study should be thought of as only a starting point for process selection. These assumptions are summarized in Table 2. Before a cost comparison can be undertaken, a fundamental aspect of joint requirements must also be assumed. For each of the joining and fastening methods selected the basis for determining the coverage or pitch needs to be determined. In other words, is the distance between rivets or the percentage full perimeter a bead of adhesive is applied established base on the need to simply hold the panel in place without objectionable gap, or is it a minimum strength requirement? We felt that providing some indication of equivalent strength would be of value and based the estimates on equivalent shear strength. When used to secure thin panels, it is unlikely that fastening and joining methods will be capable of achieving their full shear or tensile strength before joint failure. This is because deformation of the sheet material either causes the sheet to pull out from under the fastener head, or it puts a bending load on the fastener due to eccentric loading from the inboard side of the panel causing sheet bending. This effect reduces actual performance of adhesives as well because it causes the bond to be loading peel rather than pure shear or tension. We selected shear rather than tensile loading as the basis for comparison as it is probably more common case, and actually loading is closer to what would be expected in theory in comparison to assumption of tensile loading. In order to minimize the over-estimate of each method’s capacity, we selected fastener sized that were on the small end of the range of what might be used for these applications. Based on the assumptions made in Table 2, the absolute and relative shear strength of the securing methods are shown in Table 3. The column at right shows the quantity of fasteners or tack welds that would be needed to provide the same shear strength for each inch of bond line. Because adhesive isn’t applied on a unit basis, it was decided to use the length of the adhesive bond line as the basis to calculate the quantity of welds or fasteners required to achieve equivalent strength. Based on the assumptions in Table 2 and the relative shear strength of Table 3, the estimated labor required to secure the panels in the two scenarios presented are summarized in Table 4. The price paid for hardware, adhesive or consumables is, of cours, highly dependent on the annual volume required. For the purpose of this type of comparative study, it is probably more important to be accurate in relative costing as it is in absolute terms. For this reason, all materials were priced at the same national industrial supply company, so the markup is kept consistent. Our experience is that a good estimate for what the low- to mid-volume manufacturer might pay for hardware is to take the retail price from an industrial supply house and discount it by 20%. Using that formula resulted in the material costs shown in Table 5. 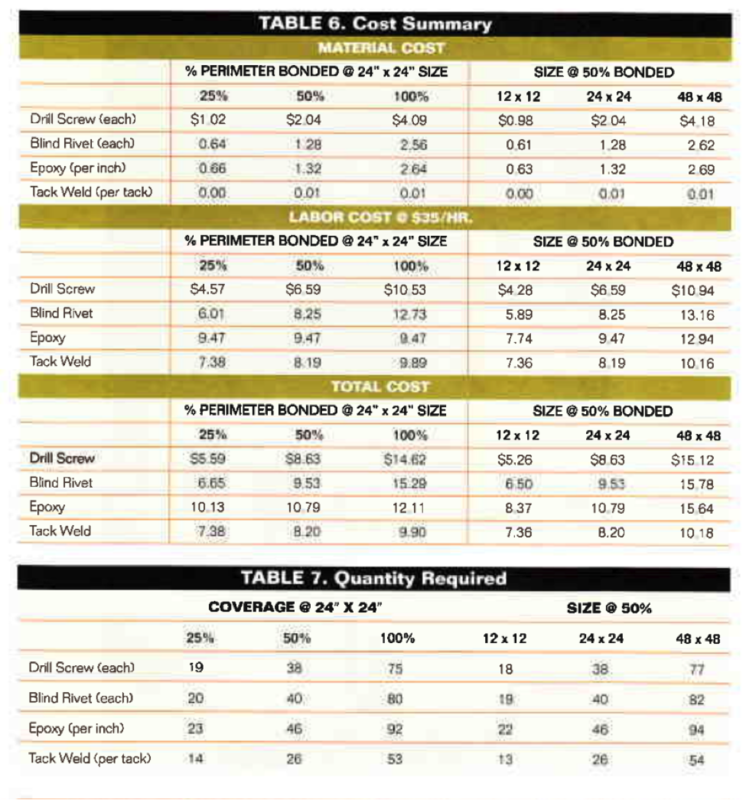 We applied a $35/hr labor rate to time estimate in Table 4 and extended the material cost by the required quantities. The tabular cost summaries are shown in Table 6 and graphed in Figure 1 and Figure 2. As seen when comparing Figure 1 and Figure 2, the total costs of the two scenarios are very similar because the quantities required are very similar (25% of the perimeter of a 24” x24” panel is very similar to 50% of a 12” x 12” panel). The epoxy joint does not behave in the same manner because the labor required to prep the panel in the first scenario was the same in all three cases. An important point should be made regarding the equivalent strength assumption. 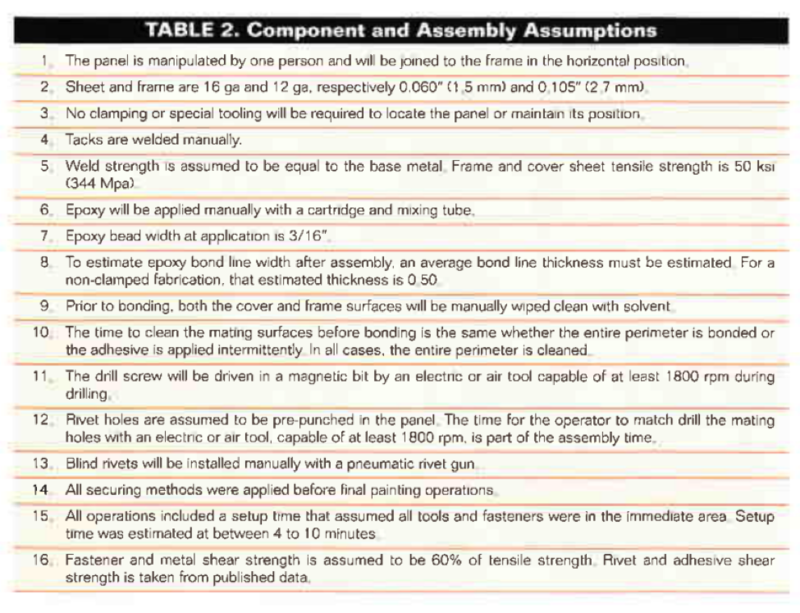 This assumption results in fastener counts higher than would ordinarily be used – up to 82 per panel, as shown in Table 7. Even so, in most cases the fastened joints were more cost-effective due to the higher setup and cleaning cost of adhesives. Had #12 drill screws and ¼” rivets been used, the fastening costs would have been relatively lower still. However, this also points out that bonded joints can achieve very high strength relative to fastened or tack welded joints when they are utilized as intended, with 100% bond coverage. When this level of strength is actually required, a bonded planar joint will generally be more cost-effective than a fastened joint. In fact, if cleaning wasn’t included, the 24” x 24” 100% bonded joint would have bad a lower cost than tack welded joint.